Last Reviewed in 2012 so take this with a huge grain of salt. Palmer is known for its amazing edge hold and fast boards. They are known for great boarder x and freeride boards but this is a more all mountain freestyle focused ride. Even though it is twinish and park friendly it definitely has a solid all mountain after taste. It seems that Palmer has been hurting the last couple years but if you can find this board have at it. You’ll probably find a good deal and have a great all mountain freestyle board. Alot has changed for 2011. The big thing is the hybrid camber shape. It rides very much like camber but has a more catch free floaty feel. This hybrid style of camber is adopted by a few other companies as well and although it’s very different from a continuous rocker shape it has improved the traditional camber shape. Groomers– Really Fun on the groomers. It is fast and fun to tear down a groomed run. Powder– With the centered stance it doesn’t help with setting back your stance. It does have a bigger nose than a tail but we felt this to be just average in powder. If you get into the deep stuff you will have rear leg burn and the possibility of getting stuck in the flats. Turn Initiation– It really is fun to turn for such a parky board. 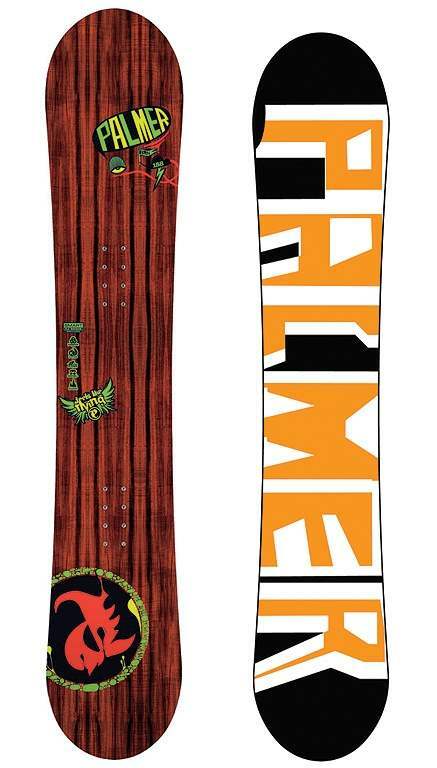 Palmer did use a lot of tech from their freeride side to make this board more fun to turn. It takes some work but really makes it fun to lay into a carve or throw out some quick turns. It had a very playful feel that made the quick turning just as much fun as laying into a deep turn. Speed- This board is fast for a park board and can straight line just about anything without sketching you out. We didn’t have balls big enough to take this board past it’s comfort point. Lightweight– It is a pretty light board but its not going to break any records but it won’t be painful to let hang off the chair. Edge Hold– Palmer is known for it’s edge hold so we were surprised to find out that it did not hold an edge as well as other boards we rode on hard pack that day. Don’t get us wrong. It didn’t ever wash out when we hit a hard patch but it didn’t have that non-slip grip like some other boards did. We feel that after full season the rails will need a lot more sharpening than other boards might. Even though the edge hold isn’t a 5 it’s still right up there and will perform really well in most conditions. Stiffness– It has a smooth medium/stiff flex torsionally and longitudinally. It sits more on the all mountain side than the freestyle side. The nose and tail do have a little less stiffness due to the Honeycomb which makes it more park friendly. Jibbing– Fun to jib around the mountain or in the park but if this is your game there are better boards. The nose and tail have some honeycomb in there that makes it a little more friendly jibbing around the mountain or Park. Switch– The twinish shape and centered stance makes it pretty easy to ride switch but it isn’t as much fun as a true twin or even a directional twin. That being said it handles pretty well and after a while you will get use to the differences. Rails/Boxes– It’s so tough on the board that we at The Good Ride are always afraid to ruin the board. That is why we always tread lightly in the park with boards that we aren’t going to keep. Sorry but we haven’t hit it big enough yet to wreck a board. That being said you can hit em with the Burn but it won’t be the best experience ever with this board. It’s a little too stiff for the big rails and hits. Smaller Rails and Boxes will be ok but if you want to or are a rail specialist then this isn’t your board. Pipe– This will climb an icy pipe wall and perform very well. If the edge hold was a little better this board would receive a 5. That being said this could still be a great full time pipe board. Jumps– This board Has the speed to hit any size kicker and has enough strength and resiliency in the tip and tail to pull it off. If this was a directional twin we would probably give this a 5 or 4.75 instead. Overall this board really impressed us. Due to it’s lack of availability we thought something might of happened to this board since its award winning year but we were wrong. It’s just as good or better than it use to be. If you want a good cambered all mountain board and probably at a very good price then go for it. We try to get as many images of the Palmer Burn, but forgive us if they're not all there.